Dendrobium Orchid hybrids are the largest group of orchid family and as such are a varied group. Found from India, through South East Asia to Australia they are as diverse in form as they are in care requiremnets. Most of these species come from the northern areas, Queensland and some from northern NSW. However species are found from the northern areas of Tasmania, right through to Cape York. They can be broken down into two basic groups, the cool growing types and the warmer growing types. All varieties like a fluctuation between wet periods and dry periods, and this varies greatly between species. One of the easier of the tropical species, Dendrobium pentapterum (pictured right) is from Papua New Guinea. However probably the best known species (worldwide) is Dendrobium nobile, one of the more important herbs that is used in Chinese medicine. The long lasting flowers are a big attraction. As for foliage, many are evergreen, however some are deciduous. After flowering the growing season goes on until new leaves stop appearing. This is the time to let the plants go into dormany which they require. Dendrobium Orchids like all plants require some care, they like to be in small pots with roots confined. An open potting mix which drains easily is essential. 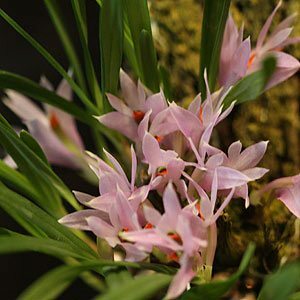 Remember that Dendrobium orchids are epiphytic and require good light and ventilation. Repoting is required if the mix becomes acid and wet or when the plant is rootbound. Detailed notes on how to grow dendrobium orchids and dendrobium orchid care are available from nurseries and suppliers. Generally between 50% and 75% shade cloth, and for all protection from the heat of the afternoon sun. This varies between the species, however the change from wet to dry is important. This differs depending on the natural climate. Those from tropical to sub tropical areas requiring wet summers and dry winters. Those from more temperate climates require the reverse. All varieties grow reasonably well in a pine bark mix, younger plants are better in a finer pine bark, as the grow a courser bark can be used. All will flower more profusely and have less root problems if they are in a pot small enough to contain the root system, so do not over pot. Like many orchids Dendrobiums prefer regular applications of diluted fertiliser rather than large amounts at any one time. Over fertilising is a sure way to kill Dendrobiums. They are not really particular about the actual fertiliser used, soluble is popular, a little blood and bone, some diluted liquid animal or seaweed fertiliser and always a low strength. Stay away from high nitrogen fertilisers if you want flowers So a dilute liquid fertiliser every two weeks during the growing season, and do not over do it. A little lime to get the pH of the potting mix to around 6.5 also helps. 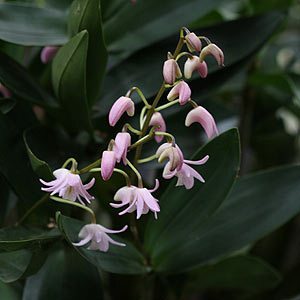 Dendrobium Bigibbum or the ‘Cooktown Orchid’ which is the floral emblem of QLD and Dendrobium speciosum or ‘Sydney Rock Orchid’, while Dendrobium kingianum or ‘Pink Rock Lily’ is found widely along the east coast of Queensland. Dendrobium x delicatum ( see image right) is an interesting natyral hybrid between D. speciosum and D. kingianum. Very attractive flowers that are fragrant and good deep green glossy foliage. Cymbidium Orchids, Odontoglossums, Dendrodiums, Masdevallia & others. Orchid pots and accessories including bark and coconut chips, gift certificates and plant naming available. Flasks available and Orchid laboratory service for green pod sowing.